What could bring an Amish widow and a wealthy circus owner together? Though Hannah Goodloe knew she'd violated countless unwritten laws, she had to visit the only man who could help find her runaway son. But when the enigmatic Levi Harmon agreed to take her on his train, the results were utterly unpredictable. Levi never expected to find the embodiment of all he wanted in a woman in the soft-spoken, plainly dressed Hannah. And for Hannah, to love an outsider was to be shunned. The simple pleasures of family, faith and place to belong seemed an impossible dream. Unless Levi unlocked his past and opened his heart to God's plan. I was initially rather sceptical of the premise of a story based around an Amish woman and a circus owner but this book turned out to be very compelling and enlightening with regards to life in 1920s Florida. The circus details were fascinating, particularly to someone whose only knowledge of circuses comes from Enid Blyton books, as was the information about the new Amish settlements that formed in Sarasota in this period. All the members of Hannah's family were very engaging and I can't wait to read Pleasant's story and see her get her happy ending. There were a few details that made Hannah's community different from those I've read about in Pennsylvania, Ohio and Kentucky, although this may also be because some small changes have been made to the Amish way of life since 1920. 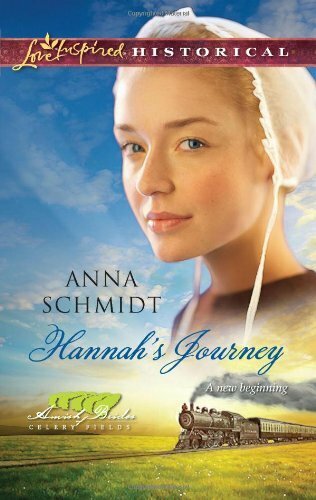 One thing that made this novel stand out from other historical or Amish romances was that the story didn't end with Hannah and Levi deciding to get married, but followed them past their wedding day to several months afterwards. I won't give anything away, but I will say that Hannah and Levi have some personal issues to overcome regarding concerns over infertility and starting a new family in a second marriage. Initially I was unsure as to whether I enjoyed reading a romance that continued after the couple have been happily married, but Hannah and Levi's struggles were genuine and I really felt for them as they tried to overcome them together. I had a big smile on my face when I finished this book! I've read one of Anna Schmidt's Love Inspired Historical novels before, Seaside Cinderella, and I think I prefer this one because the characters seemed more fleshed out and all had very distinct personalities, even secondary characters such as Lily and Gunther. Her writing has definitely developed with time and I'll be looking out for more of her books in the future. I read this book for Fans of Amish Fiction's January Group Read.